← Trip: Up Hector. Down Hector. Our intended Labour Weekend trip was sadly messed up when our intended 3.5 day excursion became a there-and-back-again trip, between Friday night and Saturday evening. This weather had been predicted to continue until Monday night, but fortunes changed. 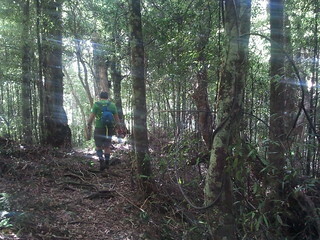 Rather than ignore the rest of the long weekend, we decided to spend Monday back in the Tararuas again. This time it was only Debbie, Craig and myself who were able to make it. 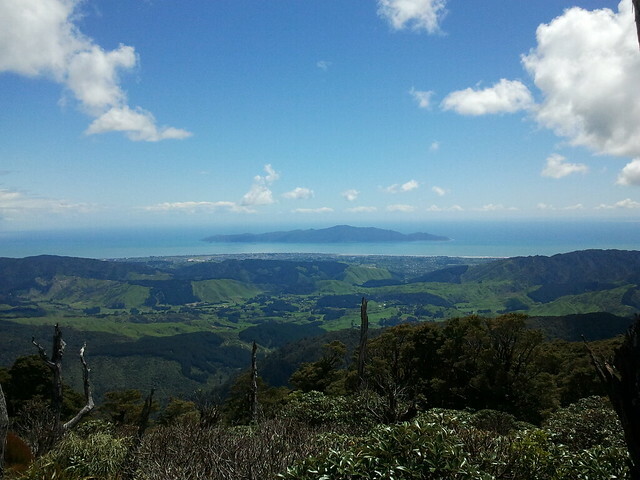 Kapiti Island, seen west from the ridge near Kapakapanui. This route is occasionally referred to as the Kapakapanui Triangle. It’s been the subject of a few search-and-rescue operations over the years. Apparently there’s something about triangles which causes people to become lost in them. In this case, some people seem to think that it relates to the loop’s accessibility for a wide range of people, which increases popularity amongst those who might not go tramping quite so much in other places. My own theory, though, is that visitors become so distracted in awe with how the interior angles of any triangle always add to 180 degrees that they forget to watch where they’re going. Did you know that any triangle can be split into two right-angled triangles, no matter what type of triangle it is to begin with? 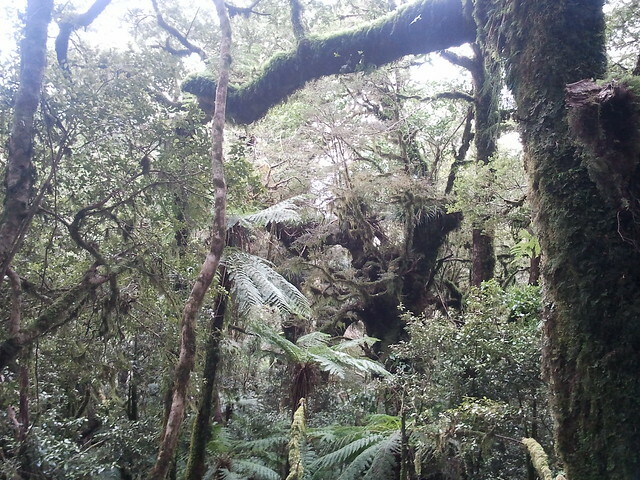 Location: Tararua Forest Park, Ngatiawa Road. People: Craig, Debbie and me. Route: Around the loop via Kapakapanui Hut, then Kapakapanui, and back to road. Well… the Kapakapanui Triangle is not really a triangle if you look at its shape critically on a map. It’s more like some kind of imperfectly formed trapezoid. The Kapakapanui Imperfectly Formed Trapezoid doesn’t roll off the tongue so nicely, though, and nor would it be a name to reliably explain why people become lost in it… unlike The Kapakapanui Triangle. I’ve written reports of nearby and identical trips in the past with other people, also by myself, and I’ve also been along the top part of this route when traversing from the Fenceline track above Otaki Forks towards Maymorn Junction. Craig and Debbie start out. Debbie drove the three of us to the end of Ngatiawa Road, and after some speedy re-organisation we were away, shortly before about 9.30am. 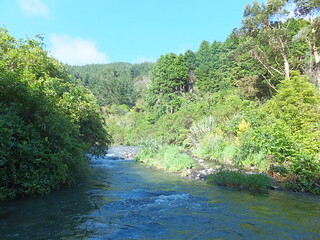 Despite generally being walked as a loop, this approach to Kapakapanui comes with a short lead-in along the Ngatiawa River. There’s a certain amount of criss-crossing the river and it’s not really possible to keep dry feet. I’ve been here a couple of times in the past, but couldn’t remember the details of how long we’d be walking in this river. At least once, having noticed a triangle on a tree, we’d thought we might have found the point where the east-wards track begins heading up its spur. The actual way is nicely sign-posted, however, and occurs during an obvious split in the river. One of the many brief crossings. Debbie and I spent much of this time arguing about whether we should have gone clockwise or anti-clockwise. 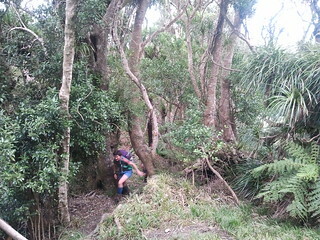 I liked the way I’d been the previous two times, which reaches Kapakapanui Hut before Kapakapanui Peak. I think it’s steeper initially, but you also get the steepness out of the way. Furthermore, Craig hadn’t yet bagged Kapakapanui Hut, and rather than gloat about how huts don’t really count if you don’t reach them as part of a trip which involves the interior of the range, I thought it’d be best to be more encouraging for him and focus on reaching there before anything else… lest our fine, calm weather were to descend into an horrendous Tararua blizzard, thereby forcing us to return the way from which we’d come. Funnily enough, Debbie was arguing for the same direction as myself. All would have been speedily settled if it hadn’t been that one of us had clockwise and anti-clockwise mixed up. This argument raged for about 10 minutes, until we finally reached the confluence where the Kapakapanui track splits, and noticed we were both arguing for an identical plan. During this time, with Debbie and myself locked in such an important debate, two people approached us from the end of the road behind us. “Hello”, I said. They ignored me as they pressed on. It was 9.45am when we reached the confluence and I discovered that, in my enthusiasm to document the previous trip, I’d removed the memory card from my camera and left it behind. In other words, my camera mostly useless except for taking roughly 5 photographs in total. Quite annoying, but I’d at least brought a smartphone, with a camera attached, for some reason. (I don’t normally take a smartphone on this type of thing, but on this occasion it was just easier.) Not so good, but better than nothing. Debbie walks up a hill. 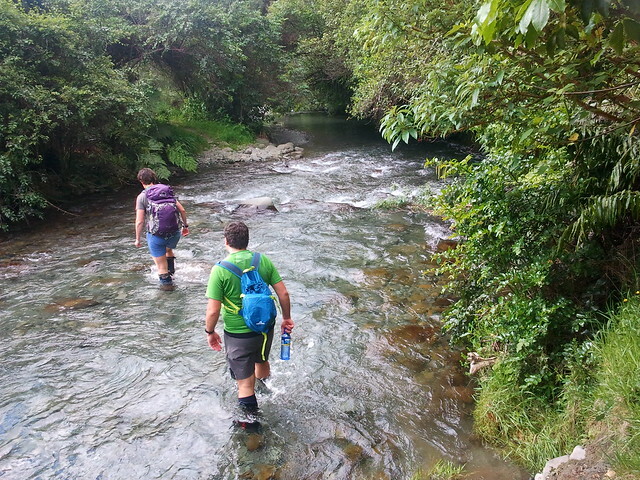 And we forded the eastern branch of the Ngatiawa River, and began our climb towards Kapakapanui Hut. Without dwelling on whether it’s clockwise or anti-clockwise (it’s definitely clockwise), I think I prefer this direction for this loop of several hours. I haven’t actually tried following it the other way, but I don’t think I really need to. This particular direction is just so awesome for so many unmentionable reasons that the opposing direction couldn’t possibly come close. After an hour of climbing, we’d ascended roughly 350 metres—not terribly fast climbing but it included amounts of stopping and lazing around, and was easily quick enough with the rest of the day remaining. Between about 480 and 500 metres, by which point the spur has broadened out, we nearly managed to lose the main track. It was only badly enough to know to back-track to the most recent track marker we’d seen, but it meant a good five minutes of hunting around and distinguishing animal trails from human trails. I think there were several human trails between the supplejack. Prior to moving on, we marked the occasion by building a small cairn under the trees. I’m not sure if it would have helped anyone or confused them further, but surely it’s the intent that counts. More climbing. Somewhere ahead of me, Debbie and Craig were trying to guess each other’s birthdays and corresponding ages, according to obscure clues. 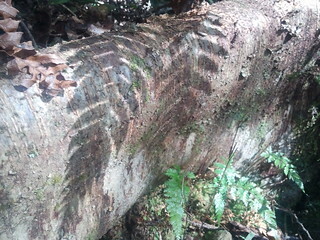 Meanwhile the trees were gradually thinning. We must have passed .755 between about 11.40am and 12pm, but I forgot to look for any signs of a route heading north, towards Mangaone South Road, as is shown on my map. 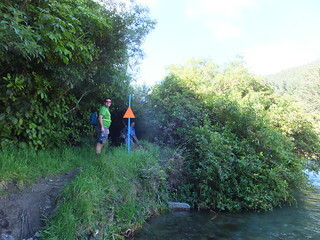 Immediately before Kapakapanui Hut, we met DOC asset number 076214, which is a sign reminding visitors that a slice of land immediately next to this land is still private land (as can be seen on the WAMS), although apparently the owners still allow foot access across a marked track. I’ll need to find out which track they’re referring, because there are several in the area. 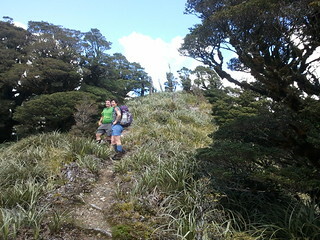 Finally, by about 12.10pm, we walked up to Kapakapanui Hut. The two people who’d overtaken us below were waiting outside the hut, eating what was probably their lunch. “Hello”, I said. They ignored me, packed up their things, and left. I suppose this Kapakapanui loop thing is one of those places which isn’t so far from civilisation that some people don’t consider it rude to ignore random other people around them—a very metropolitan mindset, which makes some sense in areas of condensed population, but doesn’t so much (I don’t think) in places like this. Whatever. Kapakapanui Hut made a nice lunch spot. It’s well kept and maintained by the Kapiti Branch of the NZDA, but the weather was nice enough on the day that we spent very little time inside, except for writing in the hut book. 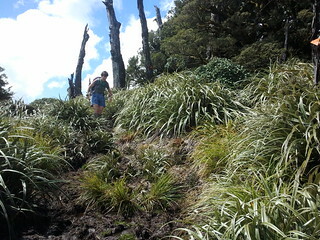 The rest of our 45 minutes was lazing in the sunshine, after which we left—towards Kapakapanui Peak. Craig being in a spot of bother. 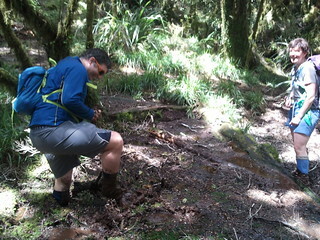 This intention to leave lasted about 2 minutes, and momentarily ceased during Craig’s encounter with part of the track which was boggy enough to cause him to question if he might have been better to be wearing some heavier tramping boots. 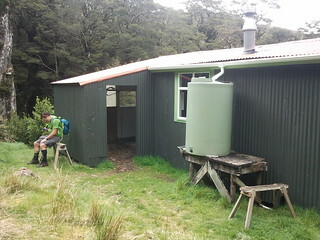 Once he’d solved the puzzle of how to counterbalance himself enough to extract his foot, and managed to retrieve his worse-for-wear daywalk-shoe, we returned to Kapakapanui Hut for an unscheduled launder and scrub underneath the water tank. We left again a few minutes later, using more effective tactics to circumnavigate around where we’d crossed previously. I forgot to check, but I believe this swampy region might have the junction near .890, with the ridge that heads (across a slice of private land) towards .762. On the second occasion, we hopped away at about 1.10pm. 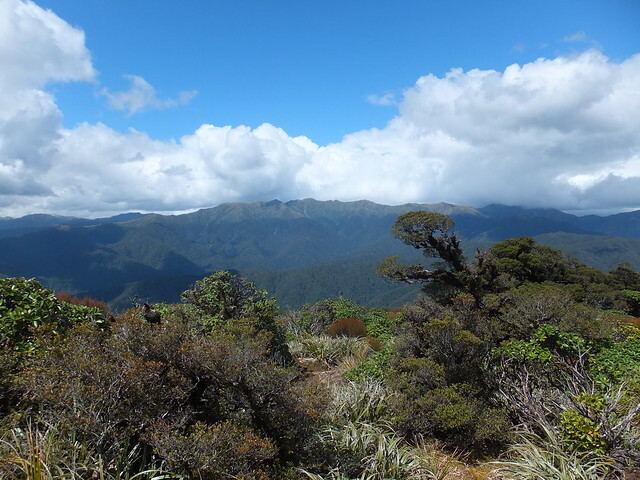 From this point upwards near Kapakapanui, the Tararua Range offers a nice range of goblin forest to decorate a pleasant climb, for at least as long as it’s pleasant weather. The weather was pleasant, and we continued our climb. It took us about 30 minutes to more properly break the bush line, finally reaching .1094, about a kilometre north of Kapakapanui Peak. Spot-height .1094 has some kind of antenna positioned on it, but behind it is a sparkling view of the more inland parts of the Tararua Range. We spent about 12-15 minutes along the ridge towards Kapakapanui Peak—dipping into trees briefly—and then lazed around on the trig near the peak for about 20 minutes. I spent much of this time staring across to the east, tracing lines along Field Hut to Table Top, Rae Ridge in the foreground, over Hector and then around the Dress Circle towards Aston and down to Elder. This had been our plan B for the long weekend prior to coming past Renata and up to here before going back to Otaki Forks, but extreme wind during the first daylight had prevented it from eventuating. The original forecast had predicted that today would also be suitably dismal weather, but everything had pushed through early, leaving this calm cumulus-decorated clear view of most of the entire route. It’s not all, either, because turning around faces a complete view of Kapiti Island off the western coast. From here it was basically a case of getting down-hill. Although the actual distance back to the Ngatiawa River confluence is much shorter, I’m not convinced that it’s as steep most of the way. This is because, on the other side, there are some particularly steep areas before the loop largely flattens out. From Kapakapanui and down via .852, however, it’s more or less a constant slope. It’s relatively steep in places, though. We left the top at about 2.20pm, and after about 25 minutes we passed .852 and within an hour we’d dropped to about 670 metres. We stopped again for a sit at about 4pm, but I think by now we were mostly focused on getting back. At about the 330 metre mark, the forest canopy opens slightly, enabling some viewing of the surrounding spurs across the valley, but by this point it’s no longer really high enough to see anything of the main parts of the range. 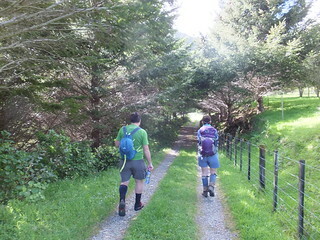 All in all, this was a nice, leisurely walk around a loop on the western fringe of the Tararua Range. I’d be lying if I said that it’s what I’d hoped to be doing on that particular Monday, as we’d all originally had our sights set on a much lengthier 3.5 day trip to take advantage of the long weekend. Under the circumstances, however, with the original trip not having been possible, it helped to bring some closure to the weekend with a feeling that the time hadn’t been completely lost. With the days becoming longer, we celebrated by driving to Paraparaumu Beach and finding a nice ice-cream shop. Hopefully it won’t be too long before another visit to the Tararua Range. 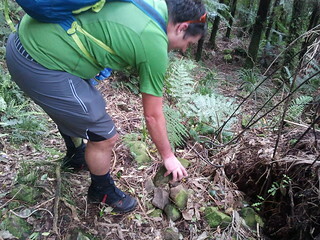 This entry was posted in daywalk and tagged bagged:kapakapanui hut, daywalk, tararuas, wellington tramping and mountaineering club. Bookmark the permalink. Manga one south turnoff is marked by a Give Way sign (visible travelling anticlockwise). Scares the bijezus out of me every time I catch it in the light of my head torch. BIG REFLECTIVE EYE, BIG ANIMAL, my brain, for some reason, says.